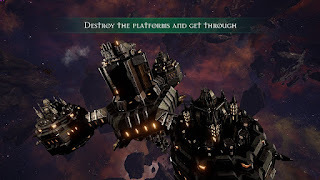 I will start this review by telling you the hard truth : Battlefleet Gothic : Armada (BG:A) is a game that makes me feel ambivalent. Now you may ask yourself, or for that matter, me, why I am sitting here with my mixed feelings. So let me start at the beginning. The first time I saw the announcement about BG:A, I was ecstatic. My mind started to go crazy, dreaming of the release day when I would be able to command my fleet of Imperium Cruisers and cleanse the universe from the filthy Chaos ! And, as soon as I could, I pre-ordered the game to get into the Beta and start enjoying this game. My initial feelings when I first delved into the game was of shear excitement. 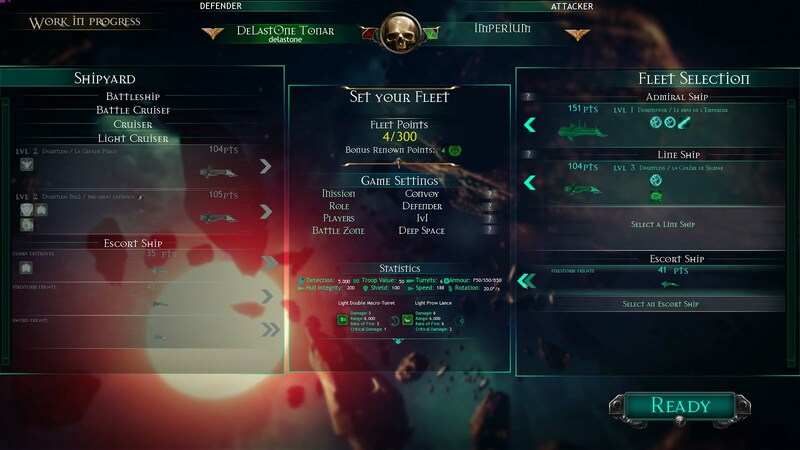 I can still remember how great it felt when I got a look at my first fleet, to play through the small campaign introduction and to play my first skirmish game against the AI. Why can't I make my recommendation for this game to all players out there? I will try to answer by the end of this review. First, let me introduce you to the game as it is and what you will get when you purchase it. - A multiplayer mode with a cooperative option and with a persistent fleet. - A skirmish mode without a persistent fleet. I won't go into any great detail about the campaign. Why? Well, because I do believe this game was essentially developed to be a multiplayer game. The campaign is there, it is enjoyable, it really is. 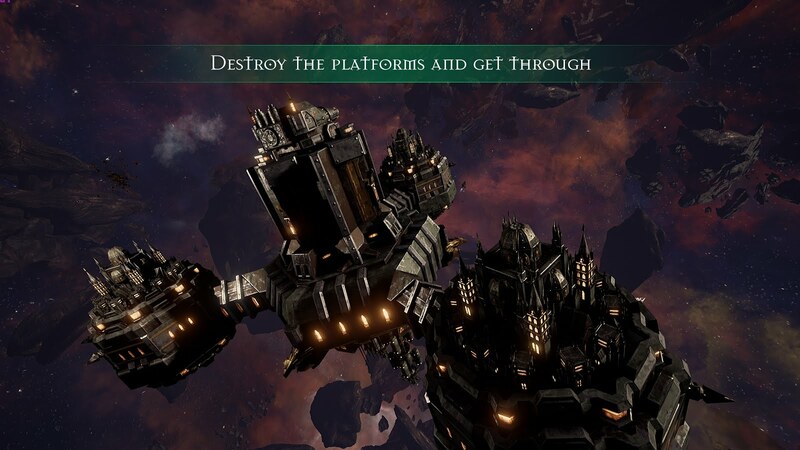 It has a great story IMHO and you can feel the love the devs have for the W40K universe. But, it in my opinion it's not the core of game, though I'd loved to be able to play it in a co op mode however that's not possible. The campaign wasn't the part of the game where I spent most of my time. It was useful in that the first few campaign missions are actually the games tutorial. So I suggest you do play the campaign or if your like me and really want the multiplayer play part of the campaign as this is where you'll start to get to grips with the fundamentals of Gothics gameplay. Playing at least the start of the campign is obviously a big help for those who want to delve into the mulitplayer, the mode I was really interested in. 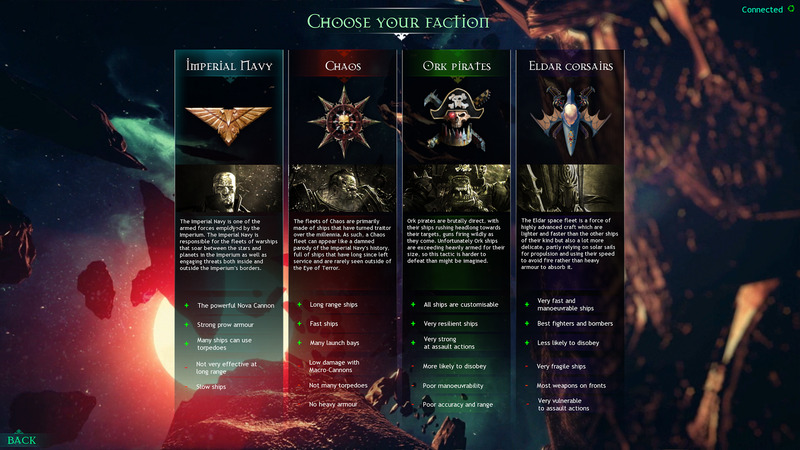 The game has four races: Imperium; Chaos; Ork; and the Eldars. Each of those races have their own design and lore. Of course, the capacities and competence of your captain and crew will be different from one race to the other. This is one of the positive elements of the game. 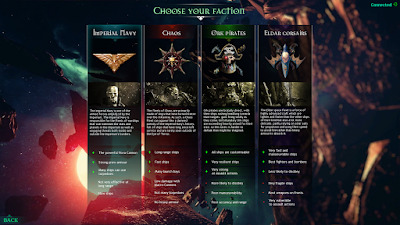 You can play any of the factions and each one will require a different approach in terms of tactics etc, which means you'll have to re-evaluate how you approach the game if you want any success with the particular faction. This also then helps the games replayability. 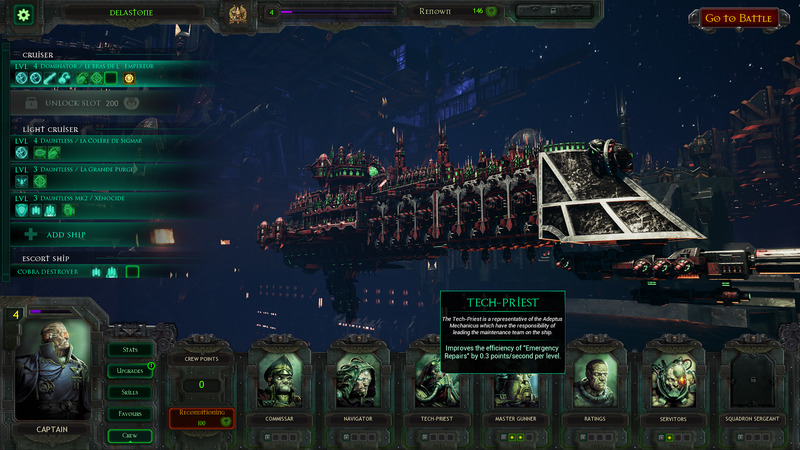 From the huge Ork cruiser that will try to ram any ships in sight to the Imperium and their boarding tactics. The truth is that the game races offer enough difference of gameplay for you to find yours of choice. Every time you play a game, you will earn some experience that you will be able to use to buy more ships in your fleet, plus you will be able to upgrade your ship systems, weapons, perks, and crew. There is a little bit of disappointment here. Some of the competence you can add to your ships are really nice and necessary, such as sending bombs away or improving your armor or gunpoint cannons. But I felt like it was pretty hard to understand how some of the crew perks really work. As I said before, this game was clearly designed to make multiplayer the core of the game. Unfortunately, the game is still suffering from some early matchmaking issues. And, it is not very rare you will end up fighting against an Admiral with a full fleet of ships under his command, while you will only be spawning with one or two of your ships, since they are under repair at the dock after a previous defeat. The multiplayer lobby should be better at calculating the 'real' number of allocated points to spend for deploying both sides. At least it should do it based on the ship's availability of the weakest. 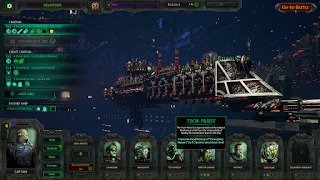 One of the things though I would love to see in this game, and that is missing at the moment, is a Coop Vs AI with persistent fleet management. While multiplayer will appeal to a lot of players, the truth is that a lot of people also enjoy Campaign mode in Coop, and there is a demand already for a skirmish mode in a coop mode. So how is the gameplay you ask? Well, here is the thing about my ambivalence. At first, the game starts easily enough. A couple of ships, max three, and a few competencies for the ships. Not much to do. You setup the max/min range of your engagement, and then you go on with the mission. The combats are incredibly beautiful. The ship models are just perfectly rendered and the effects and sounds are just immersive. On paper, the game is an RTS, so you will select your ship, their destination, and then the crew will try to follow the rule of engagement you have predefined (distance, what cannon to use, the port side or starboard, ships, and systems to target in priority, etc.). What is very important to remember, though, is that when you play, right-clicking your target to attack is pretty useless. As I said previously, you'll set the rules of engagement, click on a sector where you ship will travel and then you will have to trust them to act. The fact that you can select an enemy ship and define it as a priority target, together with subsystems such as the drives, armor, bridge, weapons etc, makes you learn very quickly to trust your Captains and their decisions in combat. Of course, while your ships have been sent to an area, you can always change those orders. I do believe the intent of the developer was to make the player really feel like a fleet Admiral. And that is what may be a little bit misunderstood for RTS veterans or people expecting combat gameplay such as in a game like "Nexus:The Jupiter incident" or "Homeworld". Your role will be to activate competencies/skill for the ships to attack, send boarding parties, buff your ships or counter the enemy. And, of course, to set the course, as previously said, and to withdraw from the battle if necessary. The captains and their crew will do the rest. 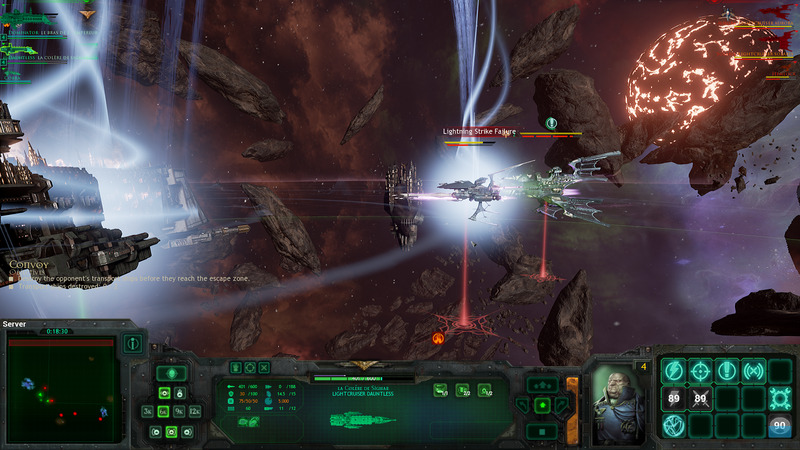 They will keep firing at the closest enemy ship or upon the ships you have selected as a priority target. This is a very nice setup IMHO. It reminds me of this Sci-fi book I read not so long ago, Ark Royal from Christopher Nuttall. The Admiral, still sits in the CIC, but he will not take over the captain role. He will decide on the global tactics, but ultimately the crew and the ship is the captain's responsibility. 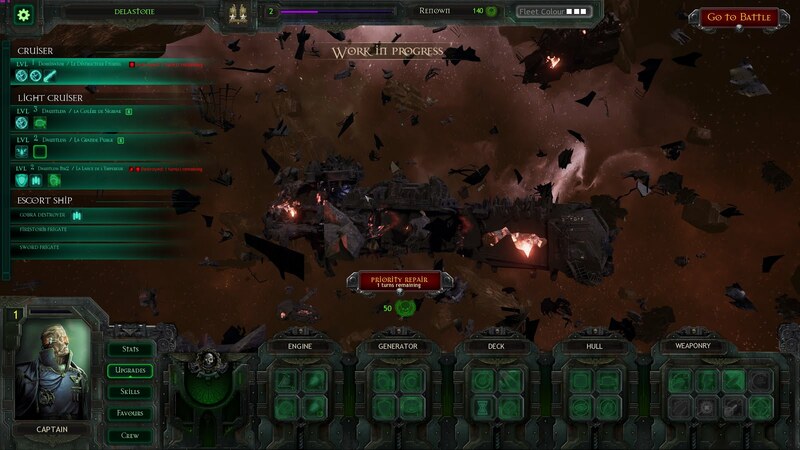 Battlefleet Gothic really does a good job of detaching you from the feeling that you are a Captain. You are the admiral, and for this very specific reason, you should be the one in control of the global decisions, not the close decisions. Don't let this become a click-fest! Use your spacebar! Because it is an RTS, and the way you play BG:A is not common to another RTS, the moment the fleets engage can just be overwhelming. There will suddenly be a lot to click and to remember during the course of the combat. When you have up to 6 or 7 ships to manage and that many number of skills per ship, you will understand how confusing and stressful the situation can become. That is why the game has a great feature implemented: the time compression. 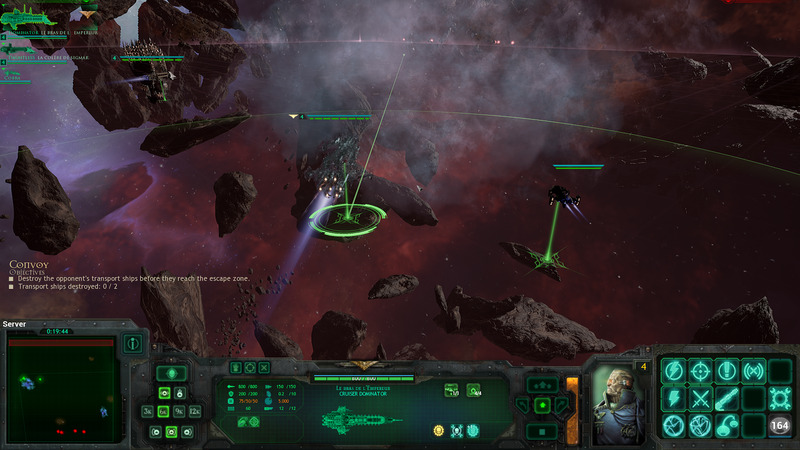 Press the spacebar on your keyboard and the game will suddenly compress time and everything will slow down and allow you to review the situation and to send new orders to your ships' captains. Sometimes I have played an entire scenario just in that mode. "Did I do that!? How did I win/lose?" That is the main thing you will ask yourself while playing this game. Somehow, you really never know for sure if any of your action have been influencing the course of the battle. You can see there is a lot of things happening, but at the end of the battle, your look at the victory/defeat screen and the feeling is mitigated. But when the battle ends, you will ask yourself if you did play well or what you could have done better. It is difficult to know if any of your actions were decisive. The game is not really good at explaining your doings and what is the best tactic for you to win. 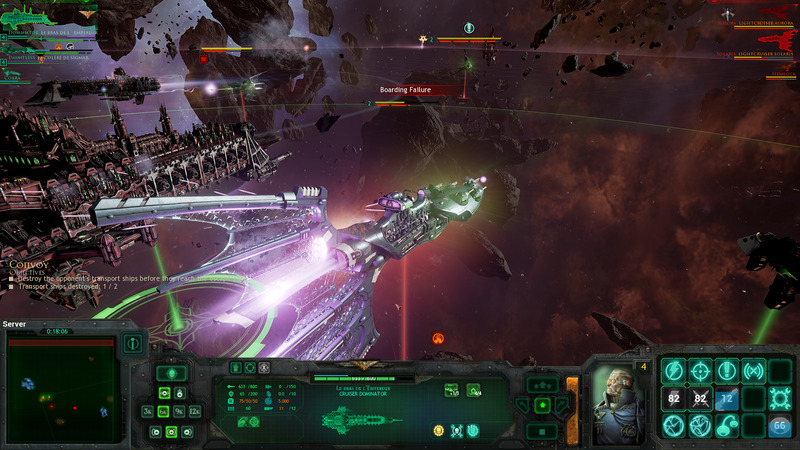 Battlefleet Gothic : Armada is a good game, well made, and extremely polished. But I must warn you: the game is tough . The learning curve can really be steep for newcomers. As I said earlier it is not for everyone but it will please the 40k license fans, the people who like multiplayer competitive PvP, fast RTS, and who are ready to accept inevitable defeat. The game will not explain all your gameplay options at first. You will have to learn and to be defeated in several ways before you understand all the feature the game offers you. Recommendation for the other players who like to think about their action and take time building up their tactics, I will advise to look at the WEGO game Star Hammer The Vanguard Prophecy, another space fleet combat game.